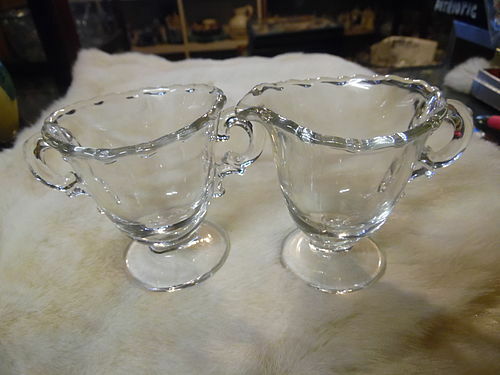 Amazing little Fostoria compote perfect for serving cheese tid bits or mints. Baroque mold and has the lovely Shirley cutting #331 made from 1938- 1956. 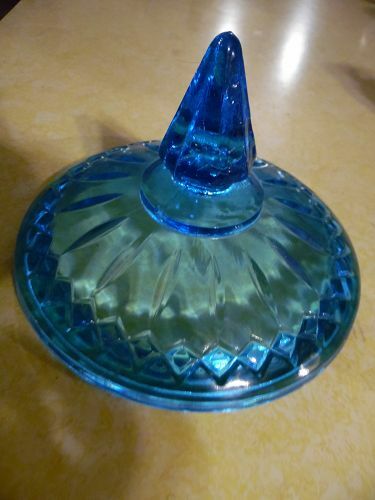 Measures just 3 1/8" tall, has a diameter of 5 1/8", and is in pristine condition. Very rare little addition to your collection. 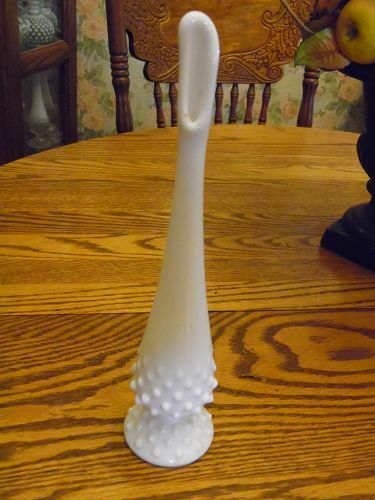 FENTON HOBNAIL MILK GLASS 11" SWUNG BUD VASE The piece is not marked but was made by Fenton between 1957 and 1973 and sticker is gone. It measures 11" tall and is free of chips and cracks and ready for your collection. 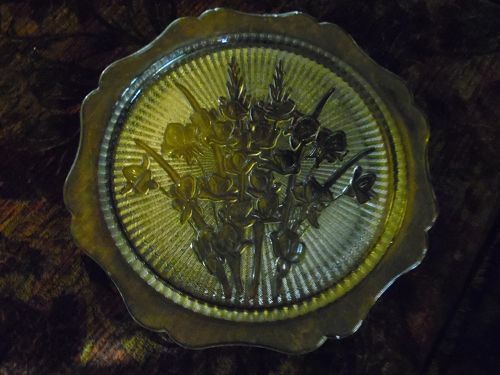 Jeanette Iris Herringbone serving plate platter 12"
DEPRESSION GLASS "IRIS - IRIS & HERRINGBONE" -- CRYSTAL serving plate platter..... Iris & Herringbone was made my Jeannette glass 1928 - 1932. Great condition with just one smaaall chip. Measures about 12" across. Has the design in the center with surrounded by a patterned herringbone design and a scallop edge. See other pieces I will be listing in this pattern. I combine shipping to save you $$. MacBeth-Evans American Sweetheart pattern 10-5/8" wide plates that have the center pattern. Monax white. Mint condition. Made 1930-1936. 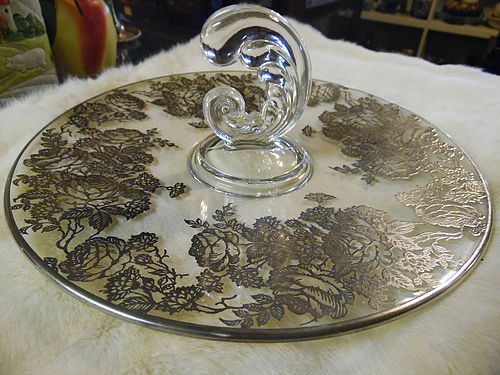 Beautiful cherry blossom serving plate measuring 13.5." Made by Walther Glas, Western Germany. 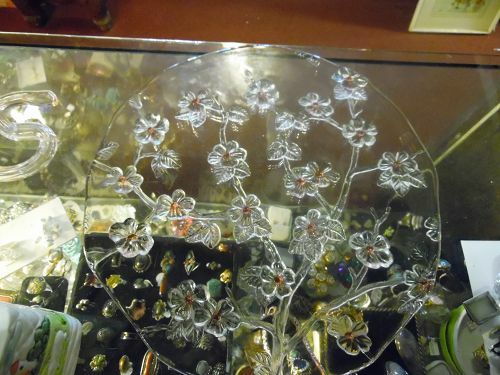 Cherry blossoms and branches incorporated into the design. Simply beautiful, and in perfect condition. Please send your zip code when inquiring, this is rather heavy. 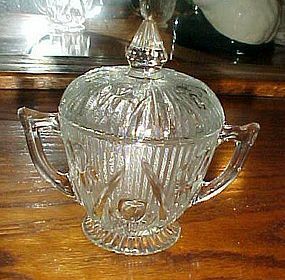 DEPRESSION GLASS "IRIS - IRIS & HERRINGBONE" -- CRYSTAL creamer..... Iris - Iris & Herringbone was made my Jeannette glass 1928 - 1932. This creamer is in EXCELLENT condition, no chips or cracks. Has the design all around the creamer. Measures 3 1/2" tall. I also have other pieces in this pattern listed. 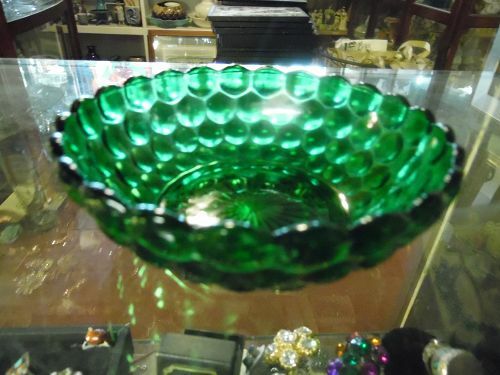 Fire King Forest green Bubble cereal bowl 5 1/4"
Forest Green Bubble 5 1/4 inch Cereal Bowl was made by Anchor Hocking from 1934 to 1965. 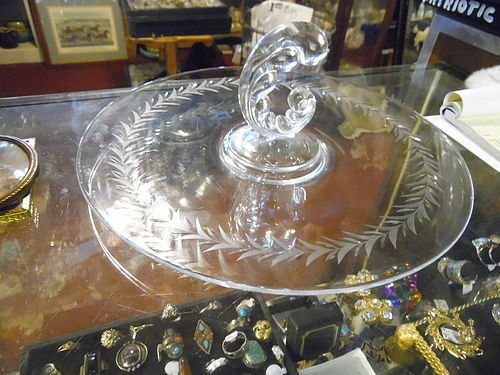 This Bowl measures 1 3/4 inches high and is in very good condition with no chips, cracks or scratches. I have 1 available riight now. See my other listing for Bubble pattern in assorted pieces and colors. 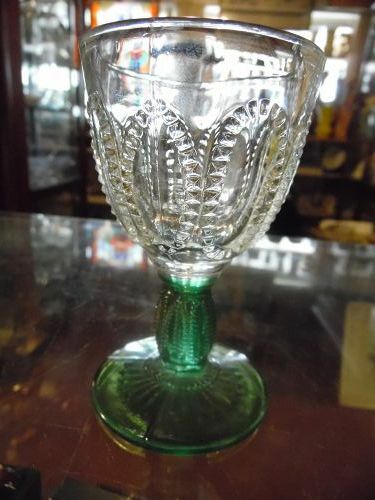 Emerald Accent Avon Wine Cordial Stemmed Glass. This glass was offered by Avon in the 1980's and now discontinued. This glass was in the Emerald Accent line. Very elegant oval zipper pattern with crystal clear bowls and emerald green stem and base. Very pretty, great condition, no chips cracks or repairs. Measure 4 1/2" tall and 2 3/4" diameter at the top. I just have one available right now. 1949-1982 Fostoria Glass "CENTURY" Pattern individual Creamer and open Sugar Bowl This is a Century pattern Fostoria Glass creamer and sugar bowl. They measure about 3 1/4" tall and are both in excellent condition with no chips or cracks. I have 2 sets available in this size. Price is for one creamer with the matching sugar. Lovely Fostoria center handle server, in the Plume shape. Measures 11" in diameter. Not sure if this is considered a sandwich server or a tidbit tray. It has amn overlay of silver in the roses. JUST BEAUTIFUL and in excellent condition. Please send your zip code when inquiring about shipping. 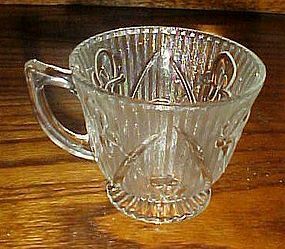 Single, perfect crystal Iris & Herringbone footed cup manufactured by Jeannette Glass Co. during the 1930's. Cup measures 2-7/8" tall & 3-1/2" in diameter. Condition is excellent! No chips/cracks or repairs & minimal use. Guaranteed vintage & NOT a reproduction. 7 are perfect.I have a cup that has a chip on the base for 1/2 price. See other pieces of this pattern I have listed. I combine shipping. 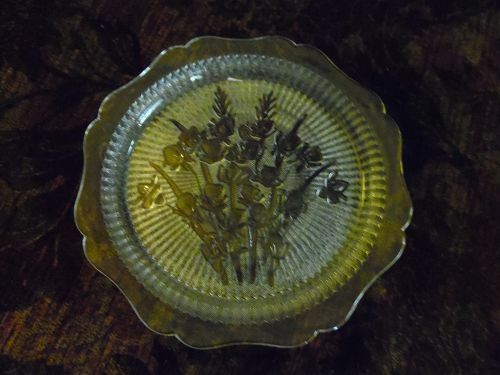 DEPRESSION GLASS "IRIS - IRIS & HERRINGBONE" -- CRYSTAL SHERBET PLATE..... Iris - Iris & Herringbone was made my Jeannette glass 1928 - 1932. 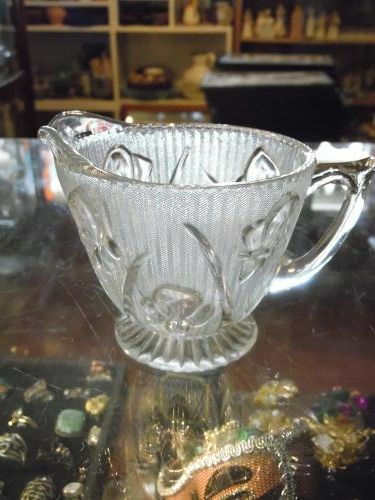 This covered sugar bowl is in EXCELLENT condition, no chips or cracks. Has the design on the bowl and the lid. 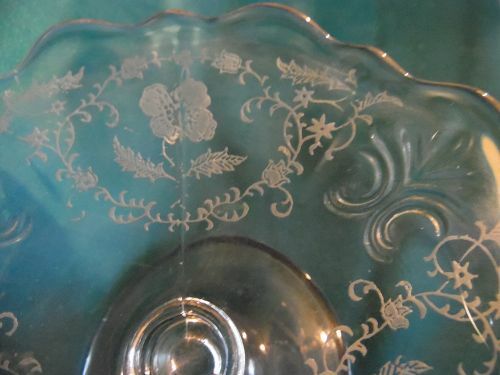 DEPRESSION GLASS "IRIS - IRIS & HERRINGBONE" -- CRYSTAL SAUCER..... Iris & Herringbone was made my Jeannette glass 1928 - 1932. EXCELLENT condition, no chips or cracks. Measures about 5 1/2" across. 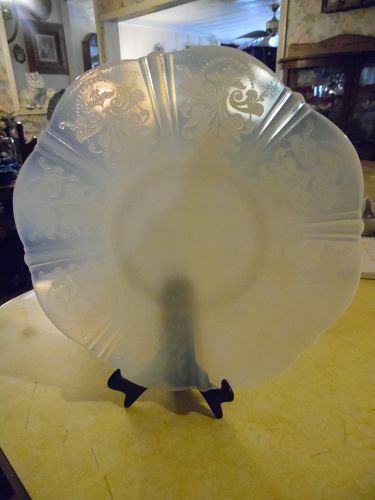 Has the design in the center with surrounded by a patterned design and a scallop edge. I have 11 available. Price is per plate. All are perfect. See other pieces I will be listing in this pattern. I combine shipping to save you $$. 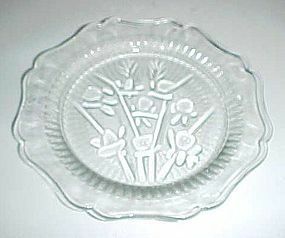 Vintage clear crystal Iris & Herringbone 9 1/2" diameter dinner plate manufactured by Jeanette Glass Co. during the 1930's! I have 8 available. 6 are perfect, 2 have very small chips (Chipped ones are 1/2 price) Price is per plate. I will be listing other pieces in this pattern also. I will need your zip code for shipping calculations. 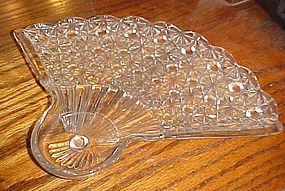 Vintage Anchor Hocking fan snack plate has a daisy and button pattern and a well to set a cup into. Perfect condition with no damages. I have 6 of these single plates and all are perfect. I have single red or green cups to go with these, listed and complete sets listed too. Check out my catalog.